Is the Japanese film The Seven Samurai a parable of our times? Was Japan a country lacking a code of honor or a country whose code of honor had been misused by the militarists? 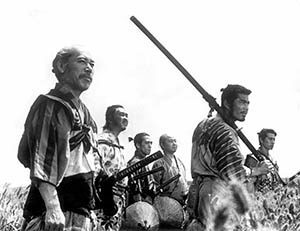 The Japanese movie The Seven Samurai (1954) tells the late medieval story of seven samurai who are unemployed and “hired” to defend a village of peasant farmers from roving bandits. (Other than food, the samurai receive no pay.) The defense of the village is accomplished with some help from the peasants, but four samurai are killed in the process. When the battles are over, the lead samurai muses that an honorable person may not receive much reward or recognition. The reward may just be in the knowledge of having lived an honorable life. This reinterpretation in this movie of the samurai code of honor called bushidō and is similar to the moral teachings in the New Testament’s “Sermon on the Mount” (Matthew 5-7). The Japanese people needed this tonic, neede to know that they were an honorable people who had been misled by the militarists. Following a leadership not grounded in a moral code is dangerous and can lead into a dark hole. Americans must consider whether the incoming Trump administration has any credentials worthy of our trust.